Appearing in criminal mugbooks would not have been too terrible as I might at least have pictures of the scoundrels! Mugbooks (commonly referred to as County Histories) often include family and biographical sketches in addition to historical information. These sketches were solicited by subscription and often required a fee for inclusion. The addition of photographs or additional text was available at a higher cost. A majority of the information included in the printed sketches was gathered from pre-printed forms and gathered a variety of genealogical and biographical information. Once submitted, sketches were usually compiled in a standardized format by an in-house editor working for the publication company (examples include Lewis Historical Publishing Company, S. J. Clarke and Co, and others). Because documentation was not required for submission, these sketches require intensive verification and should not be taken at face value. Despite the need for "intensive verification", they include some wonderful clues and amusing anecdotes as well as a few disturbing stories. They can also send you barking up the wrong family tree in hopes of corroborating the "family lore." But if you limit yourself only to looking for your surnames in the index or the digitized version of the book, you will miss some highly illuminating and sometimes surprising "historical context." In last week's blog post on Jacob Coffman -The Frontiersman, I cited several examples of stories told by members of the Coffman family regarding their ancestor, his life and his origins. These stories have fueled years of speculation and research about Jacob's life. Revisiting his timeline and my research much of which was conducting in the 1990s, I found that I had failed at the time to conduct a "reasonably exhaustive search" as required by the Genealogical Proof Standard. There is no time like the present to remedy my errors. I knew that Jacob Coffman was married to Eary Fowler in Washington County, Kentucky in 1805. He relocated his family to Illinois in 1818, settling first in Hamilton County and then moving again to McDonough County. I also knew that several of Eary's sisters also migrated with their husbands to Illinois. However, I had no idea the extent of the migration from Kentucky to Illinois until I started to "drill deeper" into the county histories. Back in the 1990s when I first conducted my research into the mugbooks AKA county histories for McDonough County, I found a few brief mentions of Jacob Coffman that are cited in last week's article. At the time we had very limited indexes from which to draw references about our ancestors from county histories. Now that we have digital versions of these county histories at our disposal, we are able to search the books much more thoroughly. For example, I came across some very tantalizing information when searching the term: "Hillsborough." This is the name of the cemetery where Jacob Coffman and many of his descendants and co-travelers are buried. On page 267 of the 1878 History of McDonough County, there is an extensive biography of Dr. John Hardesty who was buried in Hillsborough Cemetery. Few men that have lived in our county were more widely known or more universally esteemed than the subject of this sketch. John Hardesty was of Irish descent, his grandfather on his father's side immigrating to this country prior to the revolutionary war. His father, Charles Hardesty, was a soldier in the Revolutionary war and likewise in the war of 1812, and bore an honorable part in each of these great struggles. The patriotic principles of the father were imbibed by the son, and have descended to the present generation.John Hardesty was born in Virginia May 13, 1793. His mother's maiden name was Nancy Fowler, her family being one of the oldest in this State and having a number of representatives now living in this county. During the early life of John he lived and worked with his parents on a farm and in the common or subscription schools of his time laid the foundation of an education secured in after years -by self-application.When war with Great Britain was proclaimed in 1812, the patriotic feeling inherited from his sire caused him to enroll his name among his country's defenders, and, although young in years, he went forth, and during the entire campaign bore himself as become a hero and the son of one who, when the nation sought its independence, was ready to do and to die for the accomplishment of that end.In May, 1811, Mr. Hardesty was united in marriage with Miss Elizabeth Hungate, daughter of Col. John Hungate, of Kentucky, by whom he had nine sons and three daughters, five of the sons and two of the daughters yet living, and filling honorable positions in society.In 1818 Mr. Hardesty, with his family, left his Kentucky home for Illinois, and for six years resided in Hamilton county, removing from thence to Adams county, where he remained four years, when he came to McDonough county, arriving here on the third day of April, 1830, and securing for a home the southwest quarter section 9, 7 north and 4 west, now Blandinsville township, in the neighborhood of the well-known "Job's settlement." With the exception of some three years spent in Missouri, he lived in this neighborhood until death called him away.Mr. Hardesty came to this county before it was organized, and at the first election was one of three elected to fill the office of County Commissioner, to which office he was several times re-elected. In the work of organization he showed good executive abilities, and much credit is due him for the good work performed in placing McDonough in the front rank of the counties of the State. 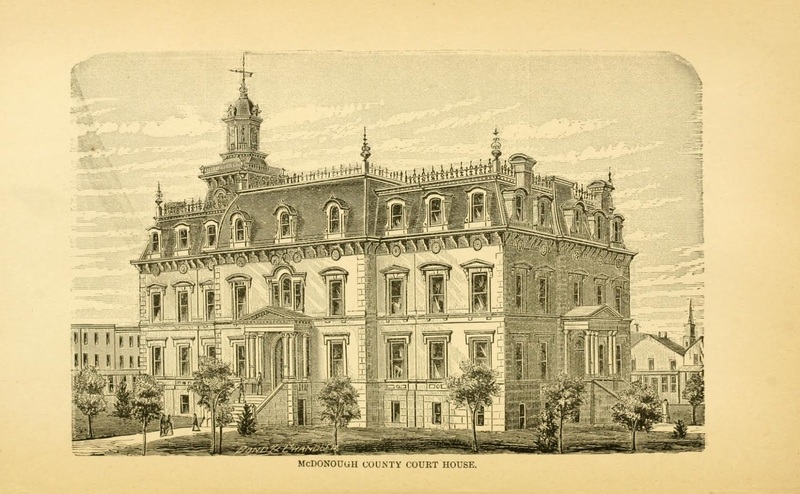 As one of the County Commissioners, he assisted in laying off the town of Macomb.While a citizen of Missouri, Mr. Hardesty studied medicine with Dr. Johnson, of Savannah, in that State, and during his residence there built up a large practice. On returning to McDonough county he continued to practice for some years. In this field of usefulness he achieved some success, bringing to bear upon the discharge of the duties of his profession rare common sense in the discernment of disease.Dr. Hardesty was a heavy built man, full six feet in height, fair complexion, and of a generous disposition. As a friend and neighbor he was greatly esteemed, his willingness to accomodate being proverbial. In the family circle, he was very strict, his word at all times, being law, but his government was inspired by the law of love, which in time begot love for himself in the hearts of his children, and his memory is now held dear by every member of the family remaining.Dr. Hardesty was for many years a consistent member of the Baptist Church, and in it held the office of deacon. His Christian duties he never neglected, and in the support of the gospel was ever ready to do his part. The two great commandments of love to God and love to man he held sacred, endeavoring to discharge the obligations resting upon him arising from each.Dr. Hardesty was called to his long home on the third day of September, 1875, and was buried near Hillsborough Church, of which body he had long been a member. Elder J. H. Delano, of Blandinsville, delivered the funeral sermon, and his body was laid away to await the summons on the resurrection morn. He died as he had lived, in the full assurance of hope, at the ripe age of eighty-two years. “Blessed are the dead who die in the Lord, yea and from henceforth they shall rest from their labors and their works do follow them." Dr. Hardesty was buried by the members of the Masonic order in this county, having been a member of that order since 1812, a period of sixty-three years. May he rest in peace, and may we emulate his good deeds. SOURCE: The History of McDonough County Illinois, Its Cities, Towns and Villages, With Early Reminiscences, Personal Incidents And Anecdotes, 1878, Page: 367-369; Digitized version at Archive.org. Dr. John Hardesty was the nephew of my ancestors, Jacob Coffman and Arey Fowler. In May, 1811, Mr. Hardesty was united in marriage with Miss Elizabeth Hungate, daughter of Col. John Hungate, of Kentucky. The Hungates are also integrally related in this Kentucky, Illinois and Missouri settlement cluster. The fact that John Hardesty and his father participated in the War of 1812 makes me wonder about what Jacob Coffman was doing during that war. It appears that the Hardestys and the Coffmans were traveling together from Washington County, Kentucky to Hamilton County, Illinois in 1818. Dr. Hardesty pinpoints his date of arrival in McDonough County on the third day of April 1830 which is the same year that Jacob Coffman and family arrived there. Both families settled in Blandinsville Township. Hardesty spent three years in Missouri and studied to become a doctor there. Jacob Coffman and several of his children also left McDonough County and went to Missouri and most of them came back to McDonough County before 1840 as did Dr. Hardesty. The Coffman and the Hardesty families both attended the Hillsborough Baptist Church and are both buried in the Hillsborough Cemetery. Hillsborough. [Baptist] This congregation was organized in 1849, and in the year following a good frame house of worship was erected, at a cost of $2,000. It is located on the southeast quarter of sec- tion 18, Blandinsville township. The house at present is in good repair. The membership is one hundred and thirteen. The following persons have served as pastors: Elder J. G. Ward, William Forrest, John Ray and the present pastor, Elder William Hobbs, who came among this people in 1868. Seeing no mention of Elder John Logan in this list, I decided to search for his name because he performed the marriage of my ancestors, William Fowler Coffman and Elizabeth Wilson. I found his name cited close to a dozen times in the history. His biographical sketch on page 435 shows that he settled in Blandinsville in 1835 and had been in other locations in the county during the very early days of settlement. At a meeting called for the purpose of organizing an "Old Settlers Association," held in Campbell's Hall in June, 1869...the following constitution...was unanimously adopted. Article 1. All citizens of McDonough county, who have resided therein thirty-three years, or who have resided in the State of Illinois thirty-three years, and who are now residents of said county, by giving their names, place of birth, age, and residence, become members of this Association. Keep in mind that this history of McDonough County was written in 1878 so many of the old settlers on this list were still alive at the time. Annual reunions were held by the "Old Settlers' Association" between 1869 and 1878. Scrolling back down the list it was astounding to see at least twenty of these "Old Settlers" were from Washington County, Kentucky as were Jacob Coffman and Eary Fowler. This list of names gives me more names to search in the other histories of McDonough County that might help to provide further historical context. This 1878 history is packed with interesting narratives by many of these early settlers showing what life was like during these pioneer times. What was especially remarkable was that most of the settlers were from Kentucky and Tennessee. In June, 1832, a battalion of men was raised in this and Warren counties, under call of the Governor, for service in the Black Hawk war. The organization was effected at Macomb, the Warren county men coming to this place for that purpose. Samuel Bogart, of McDonough, was chosen Major; Peter Butler, of Warren, Captain ; McAllen, of Warren, First Lieutenant ; John Wilson, of McDonough, Second Lieutenant. They marched to the town of Oquawka, and they were there stationed for the purpose of guarding the frontier. They were out eighty-six days, but performed no special service. They drew their rations regularly, ate heartily, played euchre, and visited the friendly Indian camps on the opposite side of the river. At the expiration of their term, they all returned to Macomb, and received their discharge. The following -were among the number serving in this war : Major Samuel Bogart, Lieutenant John Wilson, David Clarke, James M. Campbell, Abraham Dover, J. L. Bussell, Larkin Osborne, Jefferson Pennington, Mr. Shannon, William Tetherow, Asa Cook, Mr. Langley, Solomon Osborne, Orsamus Farrington, David Tetherow, Iraby Job, Andrew Calhoun, Berry Jones, Uriah Cook, Daniel Campbell, Shadrack Goens, John McFadden, George Tetherow, William Southward, Lacy Jones, Samuel P. Lewis, James Tetherow, Lewis F. Temple, James C. Head, Isaac Morris, Nicholas Campbell. This battalion was mounted, each man furnishing his own horse, and, as remarked, were out eighty-six days, and received therefor the remunerative sum of eighty-six cents per day for self and horse. Afterward the general government was kind enough to give to each participant a bounty of eighty acres of land.